Although the end of my clinical day marks the end of seeing patients, it does not mark the end of my learning process. A trip to the mailbox nightly usually reveals 2 to 3 CME opportunities via magazine subscription or flyers announcing conferences. As a new graduate, it can be difficult to wade through the different opportunities available. 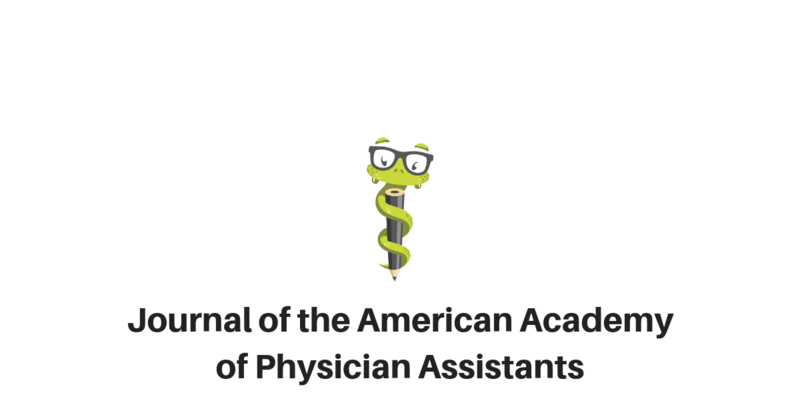 The Journal for the American Academy of Physician Assistants, or JAAPA, as it is better known, is one of the most reliable, steady subscriptions to arrive in my mailbox. JAAPA CME is available through various articles with a breadth of different topics in medicine, from clinical case reviews, to guideline updates that helps me stay current and educated on things I see routinely in practice and some of the more rarer entities I do not directly see. Today, we will review the JAAPA magazines CME process as well as some recent examples of JAAPA Post Tests. The magazine is published on a monthly basis and delivered to subscribers. A membership in the American Academy of Physician Assistants (AAPA) is all one needs in order to get the JAAPA monthly. One of the perks about the magazine, in my opinion, is that the service offers multiple different articles and case reports every month, all with different backgrounds, from emergency medicine, specialty, and primary care and beyond. An additional feature that is well put together includes rapid overviews as part of their “quick recertification series”, which is a high level, quick reading overview of a topic. Despite the excellent clinical content and case reports, on some days when I have seen numerous patients and am feeling an element of burnout, JAAPA also offers other topics that are not directly related to clinical patient care. For example, in the February 2019 issue, there was an article about the FDA and an article regarding “Associations between professional development benefits and PA career satisfaction”. Each month, there is usually an article regarding PA legislation, or an article that focuses on an aspect of the professional/developmental side of the physician assistant profession. What the Journal of the American Academy of Physician Assistants is probably most known for is their CME sections and CME post tests. This consists of two dedicated articles throughout each particular subscription that focuses on a topic with a follow up Post Test to assess the reader’s understanding of the material. In their most recent publishing, JAAPA explored two very different topics, “Cervical spine clearance in adult trauma patients” and “Recognizing, diagnosing, and treating pediatric generalized anxiety disorder”. The format of the articles begins by including an abstract summarizing the scope of the article and keywords used throughout. Following this, an introduction to the disorder or topic, prevalence, risk factors, clinical presentation, differential diagnosis, treatments, outlook, and a conclusion to reign in the key points. The articles are typically between 3 to 5 pages in length and may vary based on the topic. Across the pages include helpful bolded lettering to help the reader prepare for the post test and tables with data, screening tools, or questionnaires to be used with patients. The authors usually are from physician assistant programs throughout the country, or practicing PAs or physicians. After review and reading the article, the CME Post Test is immediately listed for rapid review. As discussed above, each issue has two articles, each of which will eventually have 5 clinical review questions for the reader to complete, for a total of 10 questions. The service does an excellent job of making the questions hone in on the key points that are addressed in the article. Whether the reader chooses to review the questions before or after reading, is up to the reader. Referring back to the articles to review is very easy and questions are straightforward, yet still cover the salient points. Once the questions have been reviewed and completed, the reader must log on to the AAPA Learning Central website in which the post test can be formally completed online. The Post Test must be passed with at least a 70% to earn the 1 hour of Category 1 CME. The website is easy to navigate and a certificate is immediately completed that allows the reader to easily import to their NCCPA account to formally log the CME. In my opinion, the JAAPA articles and Post Tests are a great way to earn CME. As a practicing family medicine and urgent care provider, I find that each month there is one article that covers a topic I see almost daily and one that I see rarely. This is helpful to help me improve my skills at one of the more common presentations in my practice, but also covers a topic I may not routinely see which allows me not to lose information I obtained during PA school. The articles are well written, clinically relevant, and the post tests are easy to navigate, allowing me to log my CME in a timely fashion, sometimes even between patients in the office. Overall, I find that the JAAPA publication is a very good resource overall for physician assistants to routinely accrue CME that allows us to stay current on changing guidelines, both in our practice as well as some of the pertinent legislation and career influencing pieces that are published. A membership assures an opportunity for monthly CME to improve patient care. American Academy of Physician Assistants website.